Our Global & Multi Postback system allows you to integrate your own monetization platform while automatically rewarding users in real time. The Global Postback system will alert your server for any and all leads generated and is recommended when your account is being integrated with a single tracking system. 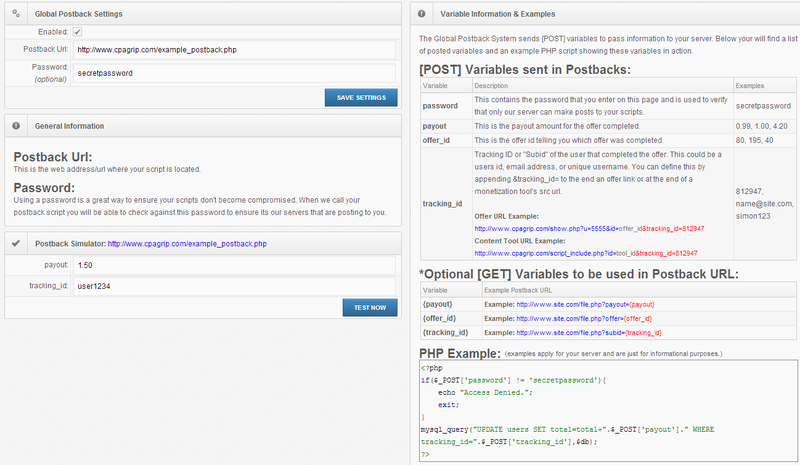 Our Multi Postback system is used in combination with any of our many Momonetization Tools. By using a seperate monetization tool (Example: Offer Wall) for each site, you are able to integrate multiple platforms each with its own postback and tracking. Note: When using multi postback, it is recommended that you disable global postback so that you are not receiving multiple alerts for a single lead.